Foreword: I had never listened to Rodney Atkins prior to this interview. A bit, here and there, leading up to meeting him, yes. As a person who has met many famous people, there are times that you meet someone you have idolized and then walk out of the room and honestly could care less if you ever hear them again. Why? Because they made a negative impression on you. 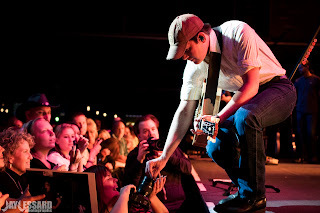 I became a fan of Rodney Atkins immediately, from the time he walked into the green room with me. Before the show, before becoming more familiar with his music. It was the man. You could immediately tell the type of man he was. So maybe this rock and roll chick has gone country a little. If that's the case, I am proud to say Rodney Atkins converted me. Talking with Rodney was by far my most favorable interview to date. He is quite a humble man and he should be proud of who he is and the impression he makes on people. In fact my final question to Rodney, I read to him, then told him I did not want him to answer it, that I would. He, his tour manager, and my assistant all understood why and he thanked me for that compliment. I hope you will understand too. SA: You seem to be a performer that donates his time to charities, raising funds... those sorts of things. I would like to talk about some of those. SA: You just returned from your USO Tour - returning from Kuwait and Afghanistan performing for the troops. Many of those were hospitalized. Was that emotional? What did you take away from the experience? RA: You know, I think the first time I visited a military hospital, it was Camp Hamilton and then we started getting invited to Walter Reed and other locations around the country. You start realizing that the more times you visit those places they start saying how thankful they are that you are visiting. Like in Afghanistan you walk out of those rooms with more than you took into those rooms. Then there's the children's hospitals we've visited. Its funny, I've gone into a room thinking I am going to sing a song and the little girl or little boy will want to sing a song back to me. It might be Rudolph The Red Nosed reindeer, but they smile. Then you meet the parents in the hallway and they say "that's the first time I've seen my child smile in 10 months". I just think that part of my prayer of coming to Nashville was to create some hit songs but it was also to open the doors for those opportunities. SA: It sounds like it's almost unexplainable what you get out of it? RA: It is, I think the best way I can narrow it down is to say the first step to doing something great is to be grateful. I don't take it for granted. I don't want anyone to ever think that I take a single second for granted. You know you want the songs to touch someones life and you try to find those types of songs. You know at first you hear a guitar lick and say "that's cool", but then you realize the song kind of takes you somewhere, it makes you feel something, it lifts you up. That's the goal. It was when I kind of stepped outside of what I thought the rules are and what I was being told the rules were that I became a successful artist. When we recorded "If You're Going Through Hell", they tried to change the title of that song. I think they tried to change it to "Before The Devil Even Knows" and in parentheses "If You're Going Through Hell" or something like that. Hell wasn't appropriate but pretty much everyone's been through that and it's about singing songs that are relatable. It's not about being perfect, it's about being human. Goes with the line, "these are my people, it ain't always pretty, but it's real".